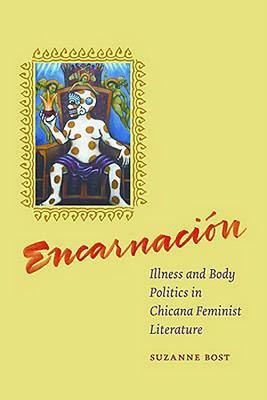 The pockmarks on the Aztec figure on the cover of Suzanne Bost’s Encarnación: Illness and Body Politics in Chicana Feminist Literature are a reminder of the proximity of disease, illness, and pain to death. Chicana artist Maya González’ painting is in fact entitled Death Enthroned, and serves as a constant thematic backdrop to Bost’s book since it embodies many of the themes that Bost will deal with in her study of Chicana feminist literature: Aztec culture, illness, death, religion, and woman’s precarious position in the intersection of these elements. Bost’s study is not the first to examine Chicana feminist literature, as many readers will note (many such studies have been reviewed by FR). In effect, the three authors Bost chooses to analyse are part of the established cannon of Chicana literature, with Gloria Anzaldúa being the face of said literature with twice as many critical articles written on her (over 200 in the MLA directory as of April 1, 2010). Both of the other writers, Cherríe Moraga and Ana Castillo, have also established themselves in the last twenty years or so. All three have been studied within other “literary labels,” such as Queer Studies for Cherríe Moraga and Ecocriticism for Ana Castillo, for example. Before moving to individual chapters examining each author, Bost explores the context of identity and grounds Chicana identity in the Aztec traditions. The author is very thorough in her reminder of all the Aztec symbolism throughout the four chapters and, for those of us who need a refresher, there is an abundance of useful information. What Bost terms as a hagiographic (reverential towards the religious figures) study of Aztec culture is also useful in that it establishes an unconventional (read non-Christian) relationship to pain, illness, death, and their relationship to representation in that tradition. Furthermore, in this chapter Bost chooses to iconize Frida Kahlo as one of the central contextualizing figures for the Chicana disability studies as she epitomizes both analytical elements, as well as being a significant influence on all three authors. All three chapters on the individual authors are well written and quite detailed. However, one can but lament the fact that Bost did not take the opportunity to write a proper conclusion to her study (one that would have reiterated the more direct links between the writers and come to some consensus about the use of Disability Studies as a useful tool to examine Chicana Feminist Literature). Although I personally find her introduction of the Chicana artists Maya González and Diane Gamboa in her conclusion to be fascinating and informative, it is Chicana Feminist Literature that her study chooses to focus on, and it would have been interesting to see if Bost had found relevant links to other Chicana writers. With the prominence of the Chicana women artists and the inclusion of the twelve beautiful color plates in her book, it is almost fitting to suggest that the book be renamed Encarnación: Illness and Body Politics in Chicana Feminist Representation.